This is the third entree I've posted from our 4th of July dinner (see BBQ Pork Tenderloin and Lobster Rolls). I have a problem, but I promise you we're not obese. There were veggies involved too. Brown sugar and soy sauce were meant to be together. You could come up with a thousand marinades out of that combination, and never go wrong. 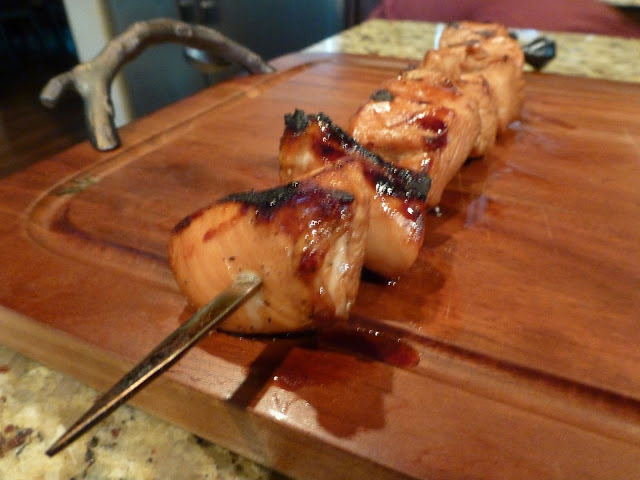 I added orange juice last week to my chicken skewers, and they were summer perfection. You could get a little more involved by adding some spices like ginger or garlic, but I decided to keep it simple. Cut the chicken into 2-inch pieces. Mix marinade ingredients, then add to a Ziploc bag with the chicken. Marinate 8 hours or overnight. Thread onto skewers, and grill for a couple minutes on each side. Deeeelish!